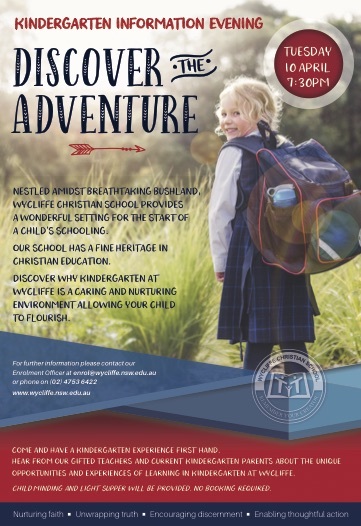 Nestled amidst breathtaking bushland, Wycliffe Christian School provides a wonderful setting for the start of a child’s schooling. Our school has a fine heritage in Christian Education. Come and have a Kindergarten experience first hand. Hear from our gifted teachers and current Kindergarten parents about the unique opportunities and experiences of learning in Kindergarten at Wycliffe. Discover why Kindergarten at Wycliffe is a caring and nurturing environment allowing your child to flourish! No bookings necessary, all welcome!